The classic cartoon television of Hanna-Barbera. Here is one television show that we all loved Captain Caveman and the Teen Angels. 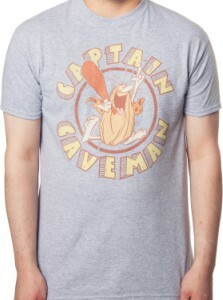 On the front of this shirt, you see an image of Captain Caveman in his cape looking all hairy holding a stick up high and ready to solve the latest mystery. Along with the image, you see in block letters that look like rocks saying “Captain Caveman”. This is a men’s t-shirt that is available in a wide selection of sizes that will range from Small to 5XL. It is made to be very durable and last a long time while also being super soft and comfortable from 90% cotton and 10% polyester.